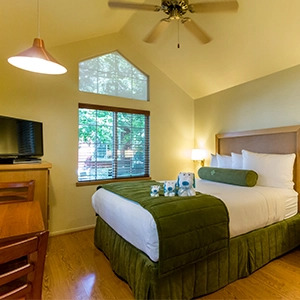 Guests adore RiverPointe Napa Valley’s home-like atmosphere and garden setting. Our resort keeps you close to downtown, making it easy to explore all that Napa has to offer. Here are a few stories from our past guests. We had an incredible dinner with the wine maker tonight at RiverPointe. Seven wines, five courses. It was all delicious and very reasonably priced. In fact, it was a deal! Thanks, Marilyn for setting it up. One of our best memories from a week of memories from Napa. The cottages were EXQUISITE and COZY. From the warm greeting we received from the front desk attendant when we checked in to the time we checked out, our stay was fantastic! We will be back. I love the " little Home" feel. No common walls. Like owning your own little home with all the amenities. In the Heart of Napa, the location made traveling easy. The decor is modern and they are very clean. The staff if very friendly and eager to help. I highly recommend this resort and look forward to returning very soon. The cottage (basically a small, charming mobile home in a lovely park) was so awesome that we decided that we wanted to stay another day. The staff was kind enough to give us the same rate for this second night, even though the price on HotelTonight has gone up and their regular rate was higher! All in all, this was way better than any hotel stay. This was a great hotel! The service was outstanding! I highly recommend this Hotel! The unit was clean and very efficient. It was great to have a kitchen. I can't wait to go back! The grounds were well tended. The staff was very helpful when we needed recommendation for where to grab lunch after we arrived. A quick drive or leisurely walk from downtown Napa, these adorable "cabins" were the bomb! Very well appointed with a full kitchen, just like having your own apartment. The beds were unbelievable comfortable - like sleeping in a cloud!